The flowers of hooded ladies' tresses spiral along the stem to form a spike. Photos by Kelly Fretwell (left) and Kira Hoffman (right). Hooded ladies' tresses is a perennial orchid. It grows to 50 cm tall. It has 2-5 long and narrow basal leaves, and sheathing bracts instead of leaves along the stem. Its flowers are white, creamy, or greenish-white, and have fused petals that form a hood-like structure. Flowers spiral down the stem to form a dense flower spike. Hooded ladies' tresses grows in dry to moist forests, bogs forests, meadows, marshes, and along streams and lakes. It is a common species in BC south of 55º N (Prince Rupert). Its range covers most of North America except for the southeast United States. It is also found on the British Isles — primarily Scotland and Ireland — where it is called Irish ladies' tresses. 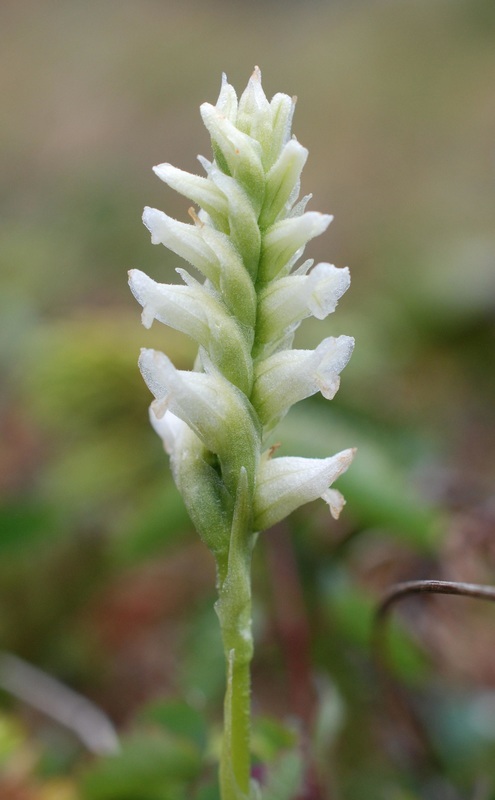 The other species of ladies' tresses found in BC is ute ladies' tresses (Spiranthes diluvialis), which is not found on the Central Coast and is rare in BC. 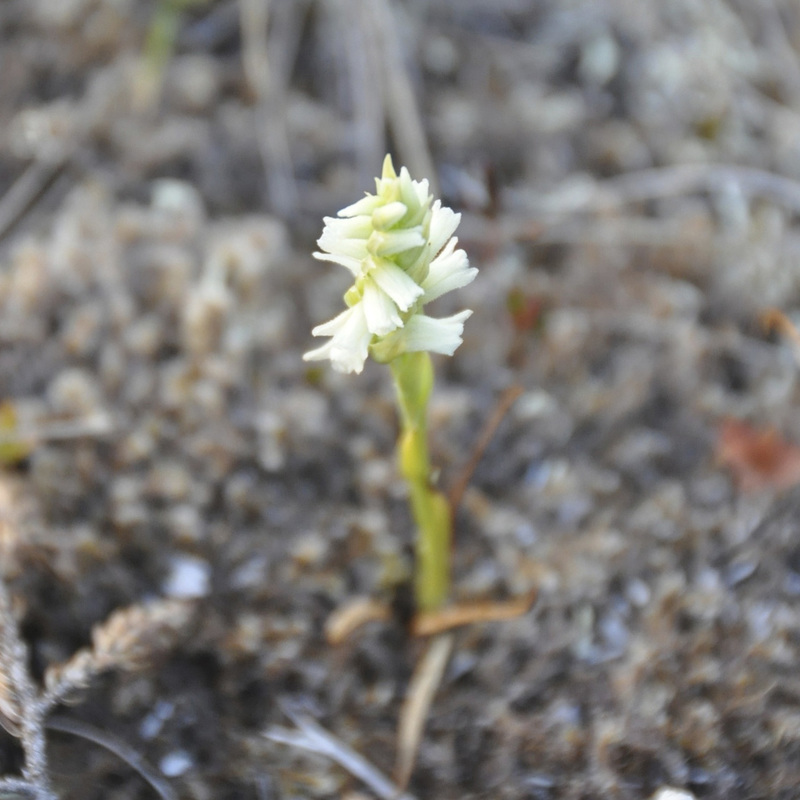 White bog-orchid (Plantathera dialatata) and slender bog-orchid (P. stricta) are two other whitish-flowered orchid species found on the Central Coast; neither has the hooded flowers or spiral arrangement of hooded ladies' tresses. The presence of this species in the British Isles but nowhere else in Europe could be due to refugia in the Hebrides and Ireland during the last ice age. Irish lady's tresses (Spiranthes romanzoffiana). ARKive.org. Accessed 28/04/2014. Pojar, J. and MacKinnon, A. (1994). Plants of Coastal British Columbia. Vancouver, BC: Lone Pine Publishing. P. 123. Spiranthes romanzoffiana Cham. In Klinkenberg, Brian. (Ed.). E-Flora BC: Electronic Atlas of the Plants of British Columbia. Lab for Advanced Spatial Analysis, Department of Geography, University of British Columbia, Vancouver. Accessed 28/04/2014.